IGValue: How does moat grading work? How does moat grading work? Several readers have asked me how I set a grade for the moat? I will try to describe this process and please pardon me if its a bit subjective as that's the nature of the exercise. A moat grading system is required, much like a checklist is required, to keep the analyst or investor unbiased and rational. Without a system like this the analyst might have a tendency to apply his or her own biases to the moat grade - for example if I like to eat a particular kind of food product from a company I might ignore some of the factors such as employee relationships in the moat grading system. Overall the moat grading system currently has 8 factors. Each of these factors is graded at -1, 0 or 1 basically suggesting non-existent or negative moat, weak moat and strong moat in the particular factor. Then the total score is divided by 8 to get a percentage. I have percentage ranges mapped for grades. If it can be replicated with 20% to 50% more than book then its a 0. This is because any company sitting on an asset for a while will probably have a 50% invested capital advantage over a 10 year period. For example when Facebook received a valuation of 15 Bil for a small stake sale to Microsoft in 2007 people were asking the question about spending 15 Bil to recreate a Facebook competitor. While this was possible to do there was pretty much no one who wanted to spend 15 Bil USD to do this. Also there was the issue of timeline and how long it would take. Interestingly Google plus has a good product but were unable to unseat achieve the reach of Facebook. 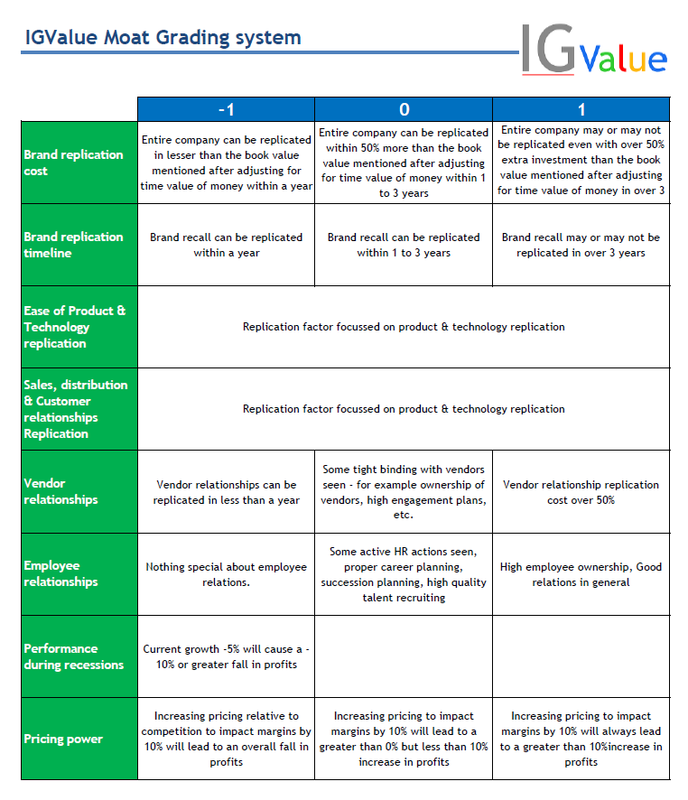 Sales, distribution & customer relationships Replication - replication scoring on sales and distribution. Vendor relationships - these are important as sometimes companies control supply chains which cannot be replicated. Japanese car companies have mastered the art of creating supply chains that they manage in an excellent manner. Employee relationships - Most managers would agree that the greatest asset they have is their employees. Some companies like Google or Microsoft have excellent people practices. Most Indian IT giants have excellent people practices. Pricing power - Again rarely found. The important thing is that if you are supplying something that has inelastic demand and you can control the price is the ideal situation. Energy companies have a product that has inelastic demand but the pricing is controlled by the market. Companies like Nestle for example have good control on Maggi prices. Please note that these factors are dynamic and keep changing as I discover new ways in which companies create a moat for themselves. In Mar 2014 this list was only 4 factors and since has expanded to the 8 mentioned above. This is a subjective rating and the only point of having the factors 3 possible scores for each is to force me to think long and hard about each in as an unbiased manner as possible.